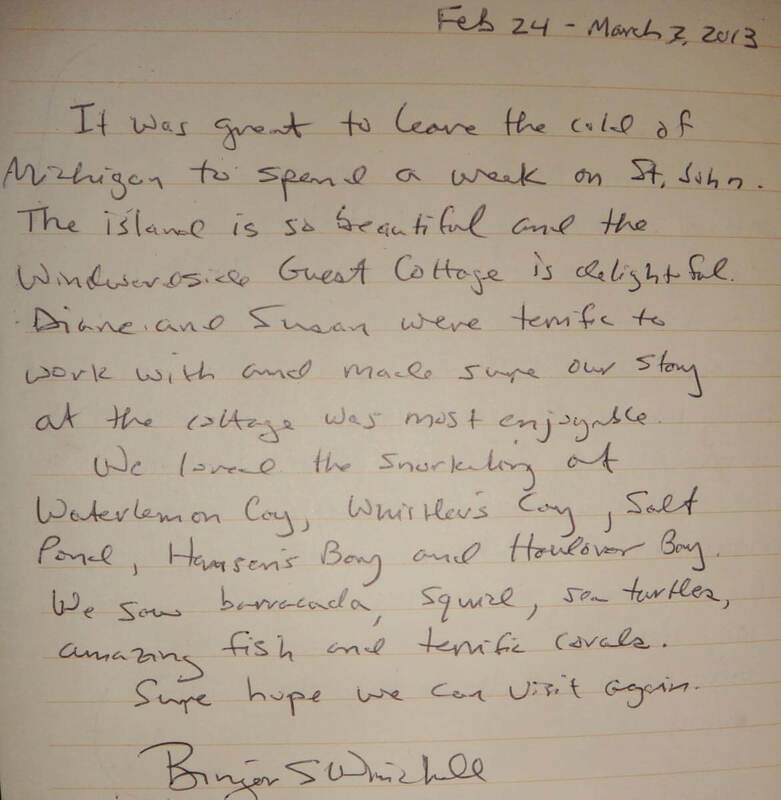 “This was our first visit to St. John and we can’t wait to come back. We spent most of our week being beach bums and loved the seclusion St. John offers. Being on the Coral Bay side of the island was well worth the extra 30 minute drive as we looked to find secluded spots to enjoy each others company as we relaxed and escaped from reality for the week. Loved our greeter Jen who showed us her favorite spots on the island. Diane was super helpful too. Million dollar views which I never would get tired of. Loved the kitchen for cooking. Beautiful deck. Overall a comfy spot to spend our vacation. Our days were pretty similar — Wake up @ 5:45 to watch the sun rise; eat breakfast (which we cooked in the kitchen); beach by 8:30 and stayed until 4:30ish; Come back to Sago to shower with the amazing view; cook dinner (or go out); relax; bed; repeat. (I kept thinking all week of ways to make this a daily routine — Living on St. John). “We loved this week of relaxing, refreshing, and reconnecting here at the cottage! Celebrating our 15th wedding anniversary in this beautiful place! “If you are reading this, then you made a great choice. Sago is one of the 4 Calabash Cottages on the island. This is our 2nd year staying with Susan and her great staff. You could actually stay your entire time in Coral Bay. Best snorkeling – Waterlemon Cay!! Long walk, but worth it. Swim around the island. Amazing! The best place to eat on the island. Right here! The table for 2 on the porch is great! Grill out and chill out! Well, we end another great vacation on St. John. Sago was great! We’ll be back! 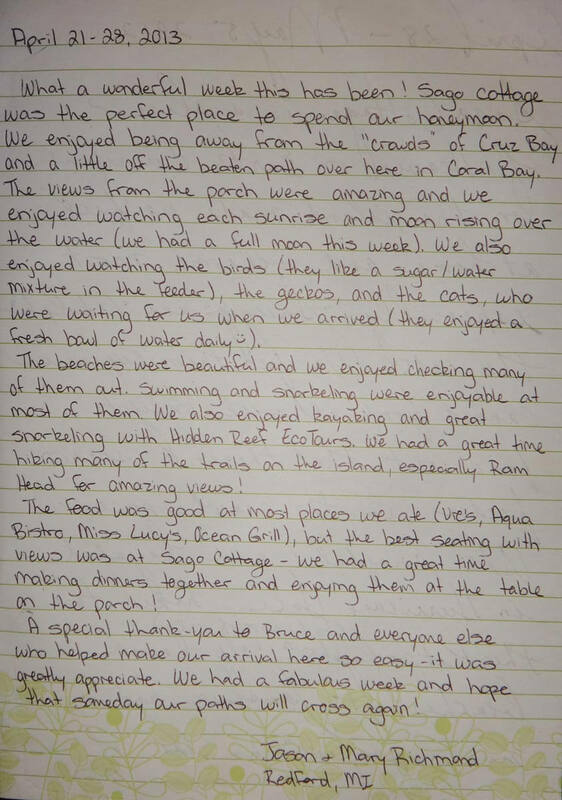 “Wrote 25 pages in our personal memory book, and there’s not enough time to share what a great time we had here! Perfect honeymoon on the quiet side of the quiet island. “This house and all its amenities. There isn’t one thing missing. The outdoor showers. The front porch. The views. The sound of waves breaking below. In a word PERFECT. “This cottage is so lovely, well laid out, bright, clean, and the surrounding flora turning really lush and blooming with the recent rainfall… all adds up to a peaceful paradise. Thanks for such a lovely stay! 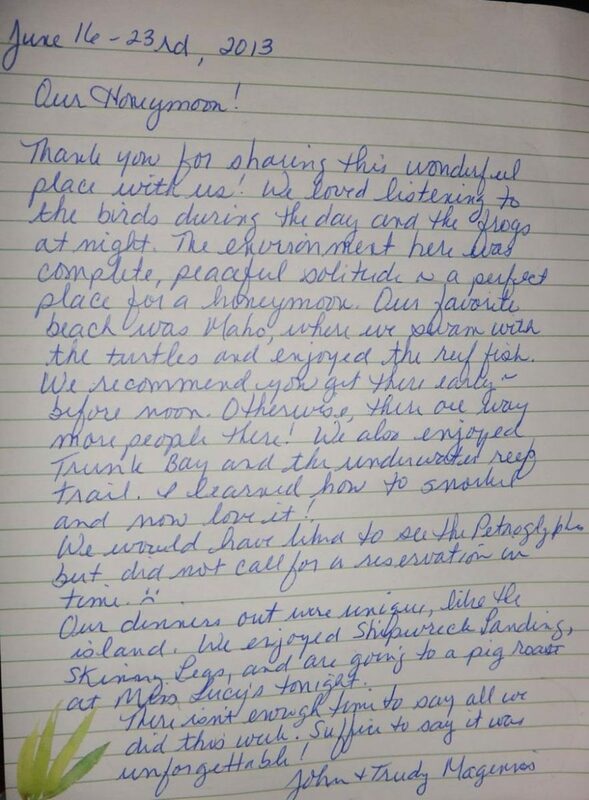 “We had a fabulous stay at Windwardside Cottage! Even when it rained it was beautiful. 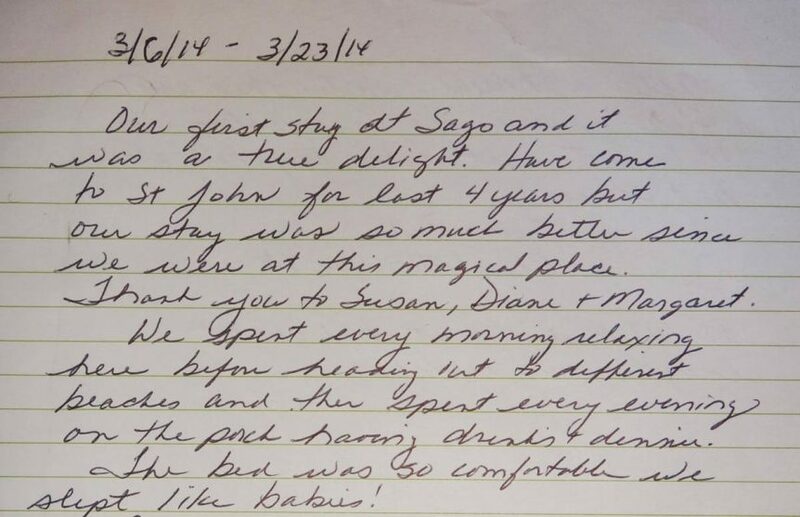 “This is our 4th trip to St John but our first time at Sago. We love the layout & location of the cottage! 2) The view was amazing particularly with the ever changing sky. “Our first stay at Sago and it was a true delight. Have come to St John for the last 4 years but our stay was so much better since we were at this magical place. Thank you to Susan, Diane, and Margaret. We spent every morning relaxing here before heading out to different beaches and spent every evening on the porch having drinks and dinner. The bed was so comfortable we slept like babies. You were amazing!!!! Your views were spectacular!!! We will miss you greatly and hope to return to you one day soon. 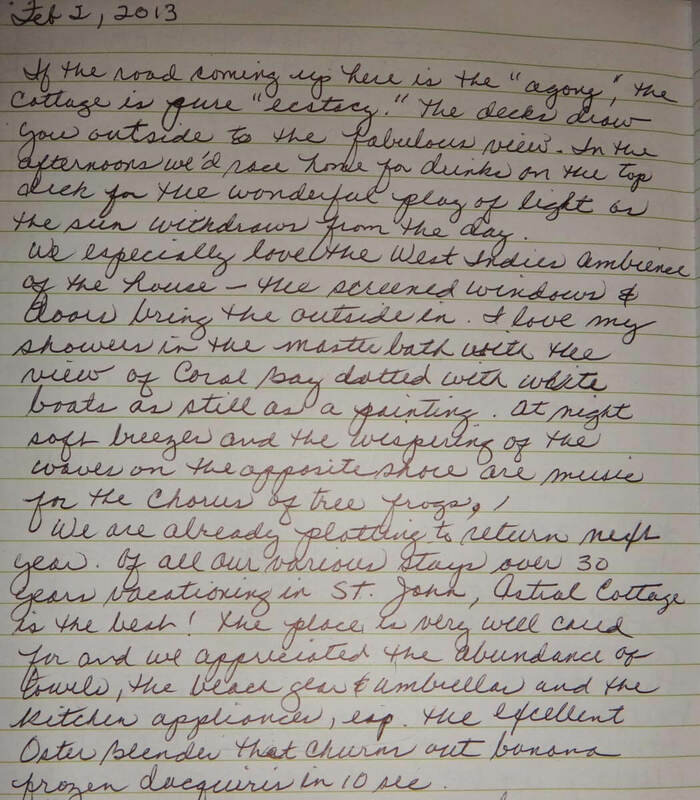 “Another great year at Sago Cottage and St. John. Our 4th visit to Sago and it was just as great as the first. Nice to see Diane again and to meet Margaret. Both made our stay special. It was wonderful to see the staff at Shipwreck Landing again and visit with our island friends we have met over the years. Coral Bay is certainly a special place. Can’t wait to come back to St. John next year with the family. No Sago in 2015 but we’ll be back to the cottage in 2016. 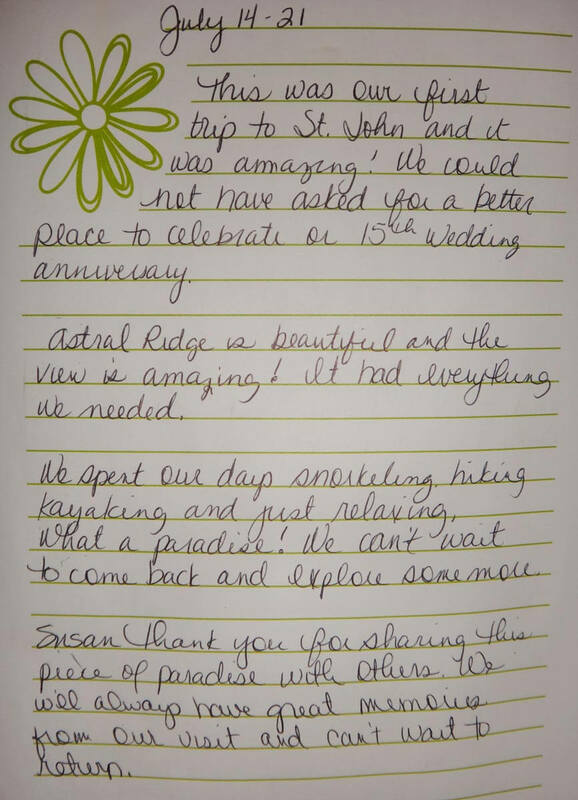 “Thank you Susan for helping me plan the best honeymoon for ourselves. My husband is in love. Thank you Diane and Margaret. You guys are the best. We can’t wait to come back next December 2014 to celebrate our 1 year anniversary. “Here for our 35th wedding anniversary. 7th time at Sago cottage! After our 7 times our advice would be: Find your “secret” Bay! for 2013 it definitely was Kiddel Bay. Beautiful healthy Staghorn Coral and school of 1000 Blue Tang. What a sight. If you are looking for turtles — Francis Bay (just be patient). Also spotted eagle ray. “All together, everything was perfect and there is just too much awesome things to talk about. Whoever comes after us, just have a blast! “What can you say about this place that has not already been said. Perfect choice for us! Celebrating our 25th anniversary. 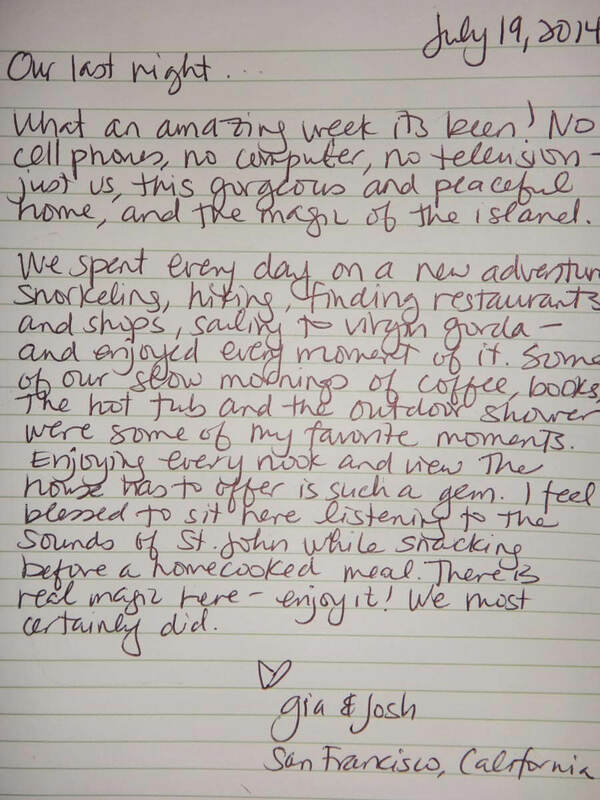 “We were here 10 yrs ago for our honeymoon and not much has changed… We loved it. We loved being on the quiet side of the island having this beautiful house all to ourselves. We ate home a lot and tried a few places on island. Cruz Bay – Rhumb Lines – Asian/Thai; Da Livio – Italian, Best Pizza! Go to every beach you can. Cinnamon Bay our favorite. 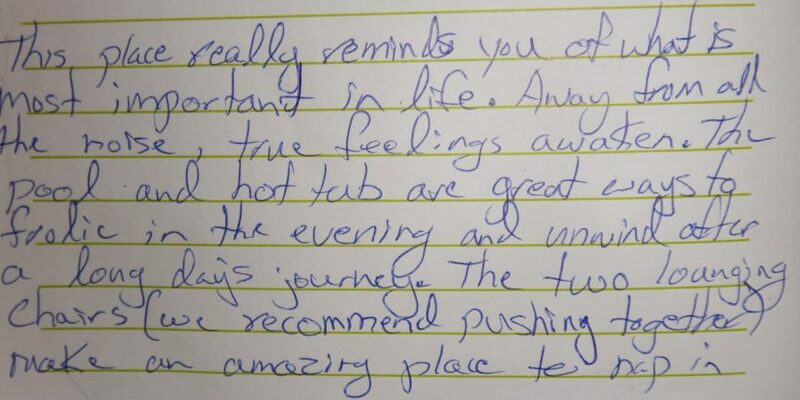 “Thank you for sharing this wonderful place with us! We loved listening to the birds during the day and the frogs at night. The environment here was complete, peaceful solitude is a perfect place for a honeymoon. “My new husband and I chose this villa and St. John as the place to start our honeymoon. (We will be staying at a villa on the Cruz Bay side for another 3 nights). Windwardside Guest Cottage is the perfect size. We spent a lot of time reading on the porch or while laying in bed. 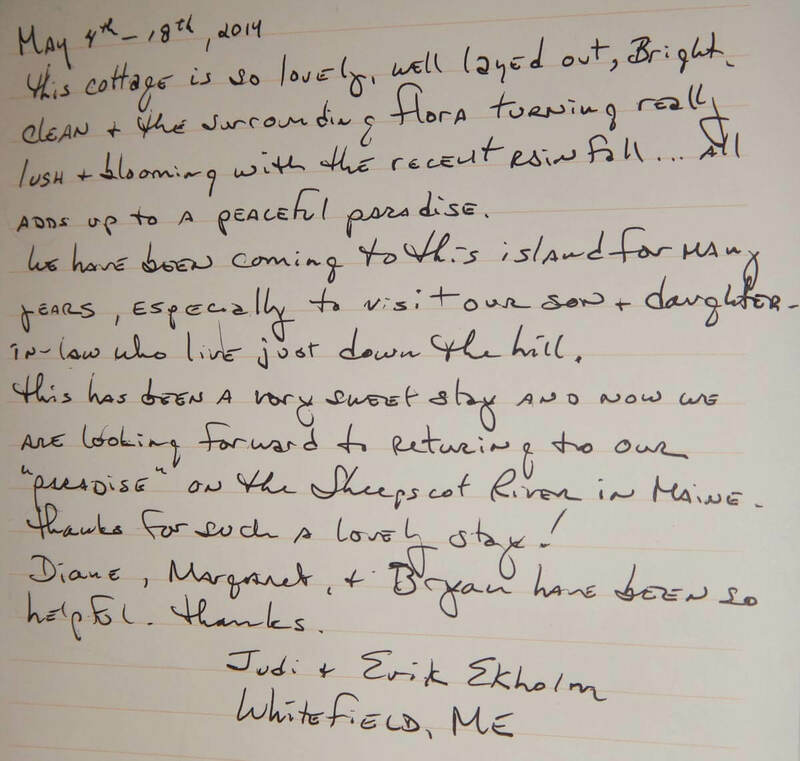 “We loved staying here at Windwardside– it was perfect! We got up with the sun, ate breakfast, fed the Bananaquits on the front porch, watched the view, listened to the local radio station and then got packed up to go out exploring. Diane and her husband Fitz were excellent hosts to meet us at the ferry and get us settled — couldn’t have asked for any better service. Coffee on the porch. Amazing views. Going home relaxed and renewed–looking forward to our next visit. “All in all, a terrific week. We will definitely plan to come here again. Our sincere thanks to Susan and Diane for making this vacation so easy and trouble free. The guest cottage is perfect. Also our thanks to Bruce for showing us the way here and getting us settled in and his tips on the island. “Sago Cottage is a slice of heaven on Earth. Everyone on the island made us feel at home and welcome. This couldn’t have been a better honeymoon… we’re already planning our return trip. Diane and Susan couldn’t have been better to deal with. “What a wonderful week this has been! Sago Cottage was the perfect place to spend our honeymoon. We enjoyed being away from the “crowds” of Cruz bay and a little off the beaten path over here in Coral Bay. The views from the porch were amazing and we enjoyed watching each sunrise and moon rising over the water (we had a full moon this week). We also enjoyed watching the birds (they like a sugar/water mixture in the feeder). “We were looking for a truly romantic getaway and we found it. Jennifer was super friendly and showed us how the “islanders” drive on the way up to the cottage. It wasn’t long before we found ourselves in the hot tub. No moon in the sky meant pretty amazing stargazing. We arrived at night so when we woke up we were amazed by the view off the front porch, website pictures simply do not do it justice. “This is our 6th year on Calabash Boom Rd, 5 of them at this beautiful home. We absolutely love it here. From sunrise colored skies at the foot of the bed to the stars over the hot tub, this house is a joy of sight, sound, smell, and soothing breezes. “We absolutely loved the house and everything about it. We are avid snorkelers, but just enjoying being here was always a temptation. Windwardside had everything we could ask for, from beach chairs to grill, to great kitchen equipment, to, best of all, the hot tub! “This is our third trip to St John and Windwardside Cottage. We planned this trip in the call to celebrate 35 years of marriage and our 60th birthdays. “Windwardside is the perfect getaway! We were without TV, cellphone and computers (intentionally!). Truly much needed relaxation. Hot tub under a sky full of stars–priceless. Thank you Susan, Diane, and Fitzroy. “It was great to leave the cold of Michigan to spend a week on St. John. This island is so beautiful and the Windwardside Guest Cottage is delightful. 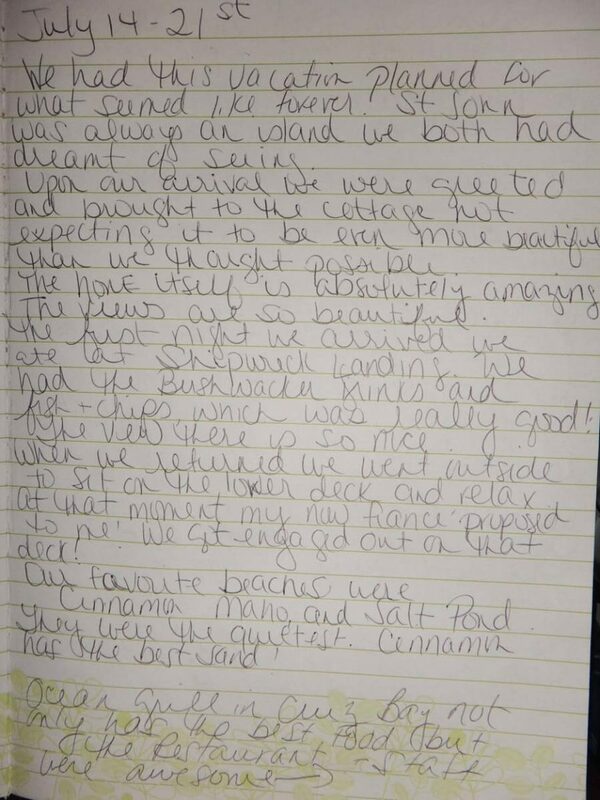 Diane and Susan were terrific to work with and made sure our stay at the cottage was most enjoyable. “This is our second visit to Calabash Cottage! 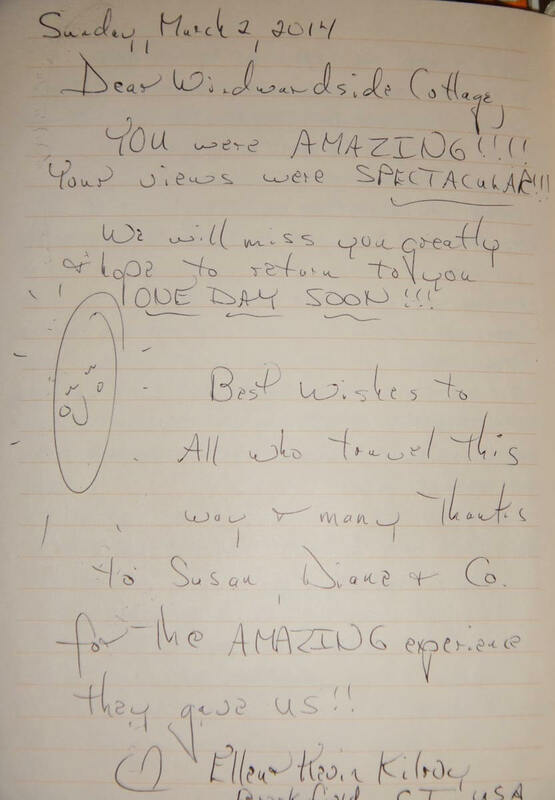 Diane and Susan have thought of everything–the cottage is comfortable and the view is breath-taking! We loved Francis Bay beach and Salt Pond Beach and Waterlemon Bay. Aqua Bistro and Shipwreck are great restaurants (and bars) and so convenient! “We came here to St. John for our 25th wedding anniversary and find it far beats anything we could have imagined. “This is our second time to stay @WWS and it is as lovely and enchanting as the first. “Awesome!!! Celebrating our 30th wedding anniversary here. Cannot thank Susan and Jennifer and Diane enough! Cottage is neat, view is spectacular. Special thanks again to Diane for checking on us. All our needs were met. “Can’t believe we have already been here for 3 weeks and that today is our last day in this wonderful place. Sago Cottage and St. John are both very rare and magical places that you never tire of. I really do understand why so many people you meet say that they came here for a holiday and never wanted to leave. We were met and shown up to the cottage by Bruce who said he came to Coral Bay for “a while” and is still here 8 years later, says it all really. “After our week in paradise, we are dreading the return to chilly, rainy mud season in Vermont. This was our first time staying in a vacation home, and we couldn’t have asked for a better experience. Once we got used to the road (which didn’t take long), we absolutely loved “our” cottage overlooking Coral Bay. What a place!